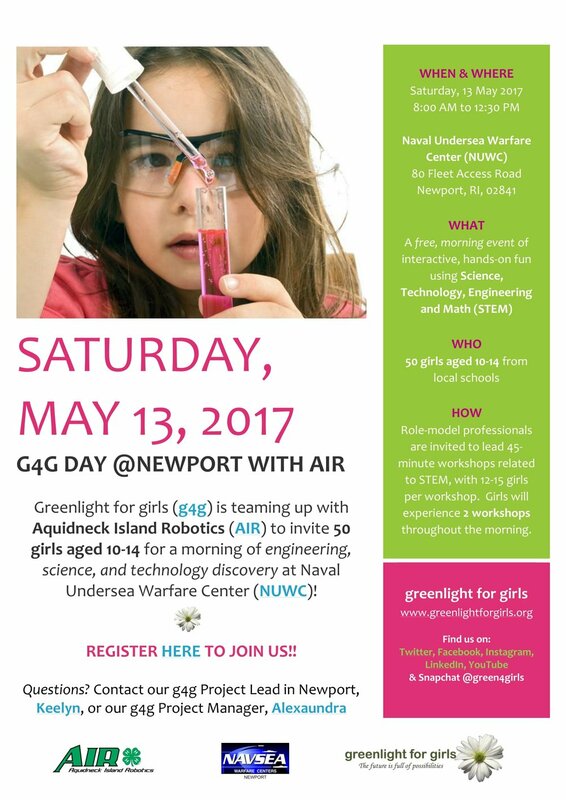 We're delighted to announce our very first g4g Day in partnership with Aquidneck Island Robotics (AIR) in the charming New England town of... Newport, RI, USA was a SUCCESS! We welcomed 30 girls aged 10-14 to spend a hands-on morning at the Naval Undersea Warfare Center (NUWC) exploring Science, Technology, Engineering, and Math through fun and interactive workshops - all while they interacted with World Robotics Champion professionals!! What? We welcome 50 girls aged 10-14 to a g4g Day event at NUWC for a morning of interactive & hands-on fun in Science, Technology, Engineering and Mathematics! How? We invite role model professionals to lead 45 minute workshops that show the link to STEM, especially engineering, with 10 - 12 girls in one workshop. Girls will experience 2 workshops throughout the morning.